Although it grows in both sun and shade, evergreen huckleberry (Vaccinium ovatum) is one of my favorite plants for a shady spot in an urban yard. It's evergreen leaves offer a great backdrop to any garden and the berries are loved by birds as well as the adventurous human. It grows to about 3-5 feet in the sun and 6-8 feet in the shade. As it's Latin name reveals, it is in the same genus as blueberries. The dark purplish-black berries ripen in August and persist into the winter. Like blueberries, they prefer acidic, well-drained soil. 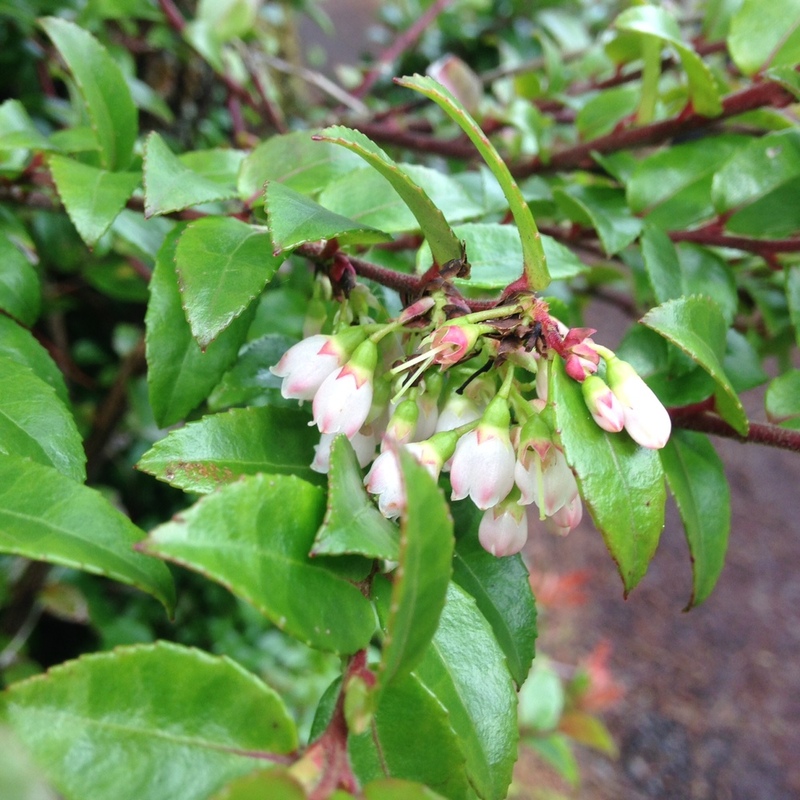 Native habitat: Evergreen huckleberry grows at low elevations in coniferous forests. Harvesting and using the berries: Harvest the berries once they're ripe or wait until the first frost when they may get sweeter. Eat them fresh or use them in jams, jellies, or syrups. If you don't have enough for a batch of jam or jelly, try mixing them with blueberries! Oregon grape (Mahonia nervosa and M. aquifolium) is another favorite of mine for your home landscape. It's holly-like evergreen leaves, striking clusters of yellow flowers, and powdery blue berries offer year-round interest to any garden. Another shade loving shrub, Oregon grape is a great choice for those tough dry shade locations. What do they have in common? They both have clusters of bright yellow flowers and blue berries. The berries on both are edible. They can both be used medicinally as a digestive bitter, an antimicrobial, and for liver support. Harvesting and using the berries: One of my permaculture teachers showed us how to harvest the berries using a berry rake. It's a nifty little tool that's basically a small handheld bucket with several fork-type tines at the opening. Simply scoop the cluster of berries into the bucket and gently pull back, raking the berries off with the tines. If you don't have one of these tools, simply pick the berries by hand. They are a bit tart and contain seeds so it's best to mix them with other sweeter berries to make jelly. Try a few fresh too while you're harvesting! Another tidbit of information: Mahonia aquifolium is the state flower of Oregon. 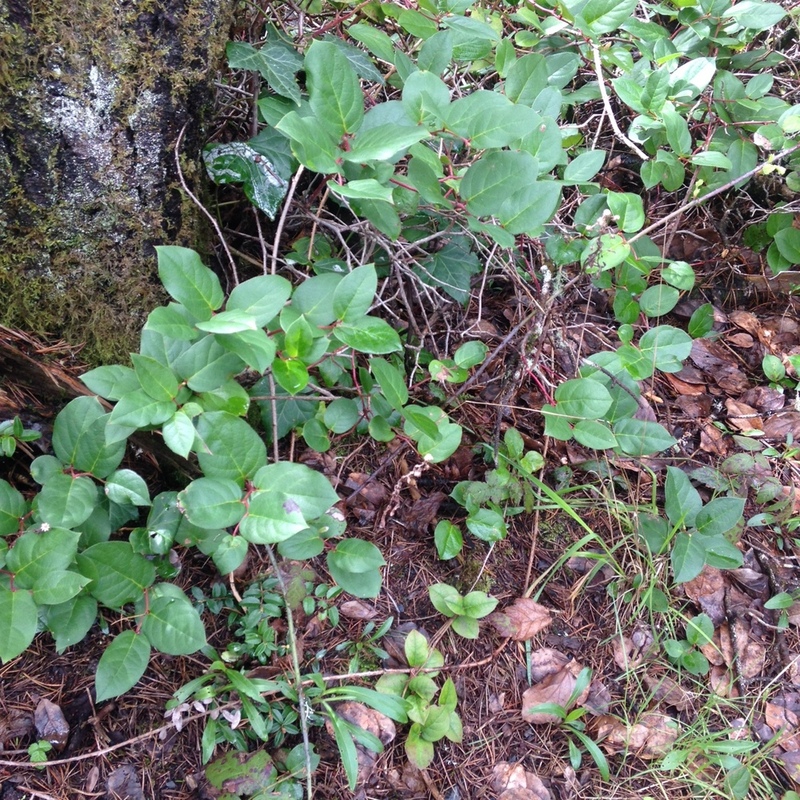 Last on my list is salal (Gaultheria shallon). A creeping, thicket-forming evergreen shrub, salal can be a great solution to the right design challenge. If you have a dry and shady location that needs to be filled in with some more life, try planting Salal. The leaves are oval and appear to zig-zag along the stem. Pink flowers emerge in spring, followed by purple-black berries in late summer. It gets anywhere from a couple feet to around six feet tall, depending on the amount of sunlight and water. They are typically lower growing in the sun and taller in the shade (especially in moist shade). Harvesting and using the berries: The berries are sweeter than Oregon grape and can be used alone or mixed with other berries. Eat them fresh or make jam, jelly, or syrup. Medicinal uses: The leaves may be used medicinally as a tea. There is still some time to plant this spring! Hopefully you've been inspired you to add some native edibles to your landscape. What edible and/or medicinal natives do you have in your yard? What are your favorite ways to use them in the kitchen or as medicine? Older PostWhere is the Best Place to Grow Your Veggies?